Adam reviews the eigth episode of the new TNT Drama The Alienist starring Daniel Brühl, Dakota Fanning, and Luke Evans. The series is based on the Best-Selling Novel by Caleb Carr. 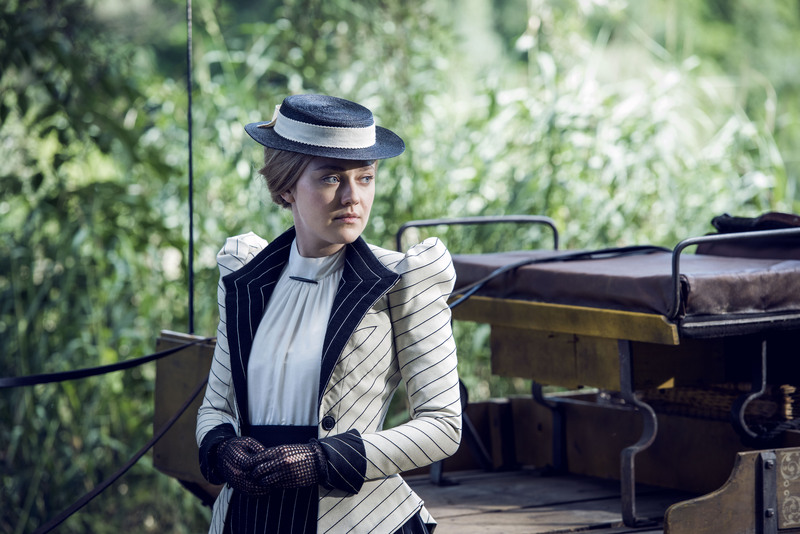 “Psychopathia Sexualis” the eight episode of The Alienist finds the team away from New York tracking the leads found by Howard (Fanning) in last week’s episode. The Isaacson Twins, Kreizler and Moore, and Howard all on separate but interconnected trips. The Isaacsons head west to the great plains. Kreizler and Moore head to the Nation’s Capital in search of records. Finally, Howard tiring of being told she cannot do things goes in search of clues in the Northeast. The puzzle of who this killer is coming together piece by evidential piece, but a very dangerous cost to everyone. In prior episodes what appeared to be banal threats are now anything but. Many series often lay setups and payoffs of these nature, never really fulfilling on their promises. The Alienist has proven continually to not be that type of show. The writers have been able to consistent defy expectations of this reviewer in how they keep those payoffs of retribution play out in the narrative. A huge component of the series thus far has been slowly revealing the malicious threats in all corners of society. It is not just the serial killer mutilating boys that is a true menace, but corrupt police officials, politicians, socialites, even shockingly the robber barons of America (insert cheeky sarcasm here). One of the overriding arcs that has played out in this limited series is the ever-growing circle of corruption Kreizler, Moore, Howard, and Roosevelt find themselves witness to. From the series start, the face of corruption was your typical one of police corruption we had seen in turn-of-the-century stories. It was exemplified in the form of Captain Connor (David Wilmot). One of the fascinating through lines is how the writers have gone beyond Connor to those who corrupt him, Former Commissioner Byrnes (Ted Levine). Even those who corrupt Byrnes, and beyond. An Ouroboros of corruption. No one facet or entity of New York City is clean of bribes, payoffs, payouts, threats of death. The Alienist excels at showing us just how deep and disturbing that corruption was and is but never making it feel artificial or obvious. This systemic corruption in the show is portrayed as “business as usual”. That sort of off handed almost clinical display of that corruption through comes even closer in this episode. The consequences of the team upending decades and decades of compliance come home in this episode. As this motley crew casts a threat on the normal conventions of police work, bucking the system, if you will, the corrupt system is bucking back. Until now it has been always a mild threat to Kreizler, Moore, Howard, the Isaacson Twins, and even Roosevelt. This episode proves that those mild threats are more than mild. They are life shattering.